The Calvin cycle is a series of biochemical reactions that take place in the chloroplasts of plants. The Calvin cycle makes it possible to produce glucose, an energy molecule, from carbon dioxide. This is called carbon fixation. 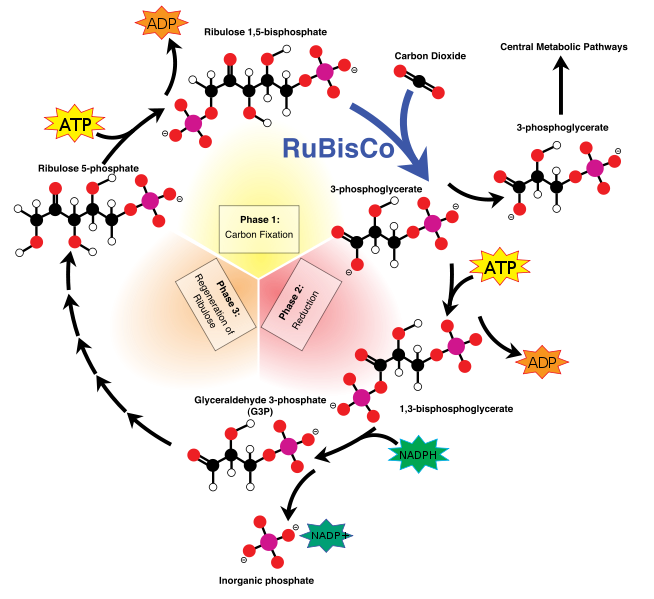 This biochemical cycle constitutes the second phase of photosynthesis: after photochemical reactions convert light energy into chemical energy, in the form of ATP and reducing potential, the Calvin cycle uses this energy to fix carbon in new organic molecules. regeneration of ribulose: one mole of glyceraldehyde-3-phosphate is exported for the plant's biosynthesis, while the five remaining moles are recycled into three moles of ribulose bisphosphate. The Calvin cycle can then begin again.